I did this monsters storytime the last week of October as a slightly scary option that wasn't actually HALLOWEEN. But one nice thing about monsters is that you can use this theme any time! 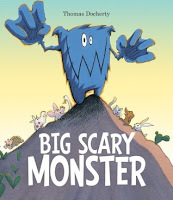 Book: Big Scary Monster by Thomas Docherty (Templar, 2010). Big Scary Monster loves scaring all the other creatures, but when he heads down the mountain in search of more creatures to scare, he finds himself getting scared and lonely. Felt: Go Away, Big Green Monster (based on the book by Ed Emberley) Not only does this felt story reinforce body parts vocabulary, it shows kids that they have nothing to fear from monsters. 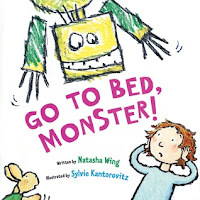 Book: Go to Bed, Monster by Natasha Wing (HMH, 2007). 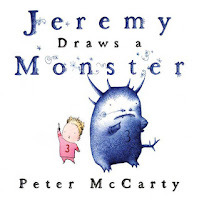 Book: Jeremy Draws a Monster by Peter McCarty (Henry Holt BYR, 2009). Jeremy is a lonely little boy but when he attempts to draw himself a friend, he ends up with a rude monster. Felt: Five Little Monsters Jumping on the Bed. Miss T made me this super cute felt with the template from Falling Flannelboards. 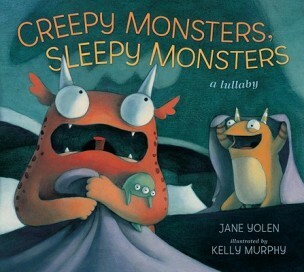 Book: Creepy Monsters, Sleepy Monsters by Jane Yolen (Candlewick Press, 2011).